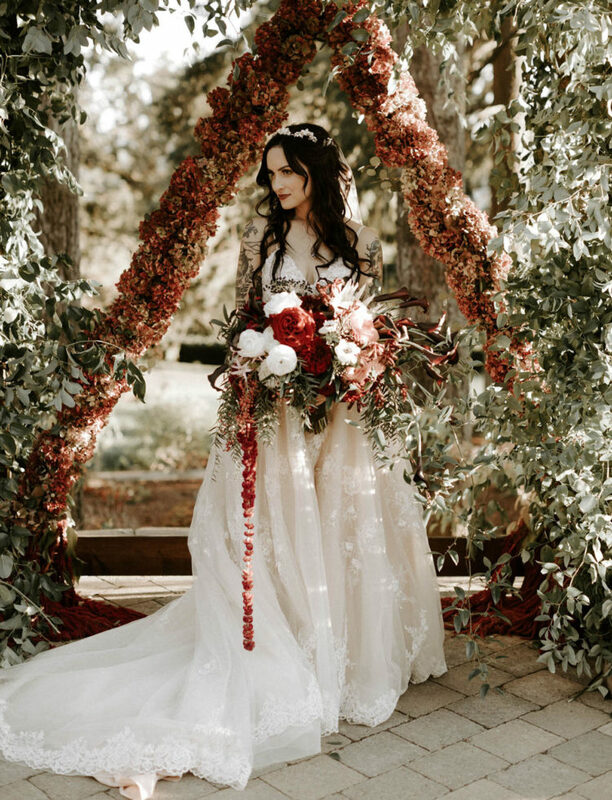 Today’s darling bride, Marina, is a makeup artist and knew she wanted a day brimming with rich hues and luxe details. Dane, the groom, is a woodworker, so together they’re both seriously creative, which will be clearly seen in the wedding decor. 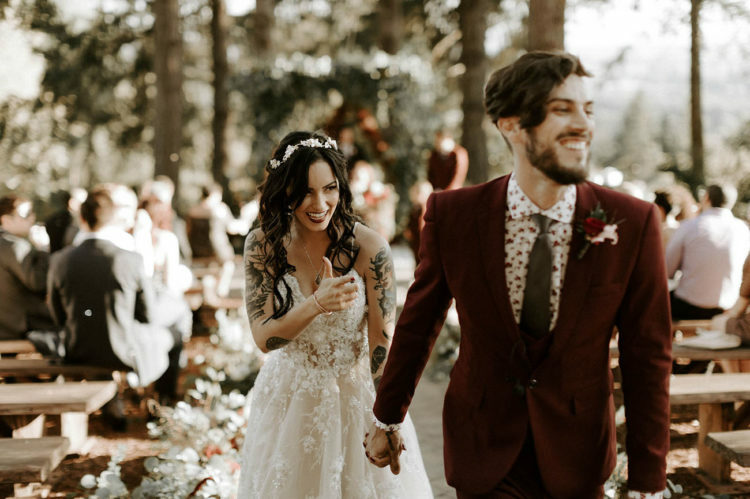 The bride was first looking for a sleek minimal gown but she suddenly fell in love with a princess-like dress with much lace and sparkles all over, she asked the designer to add 3D flowers to the dress to make it more personalized. The dress, which was a spaghetti strap one, showed off her tattoos, and she added a burgundy lip. She was rocking a matching floral headpiece and a veil to complete her exquisite look. 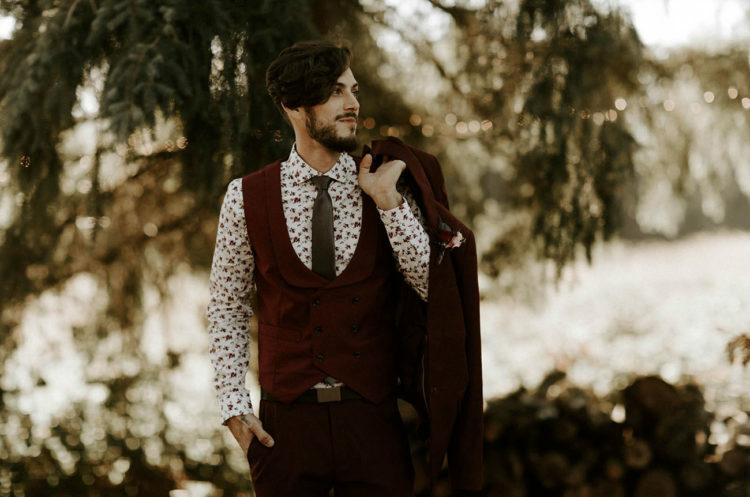 The groom was wearing a burgundy suit, a floral shirt and a grey tie and shoes with no socks. 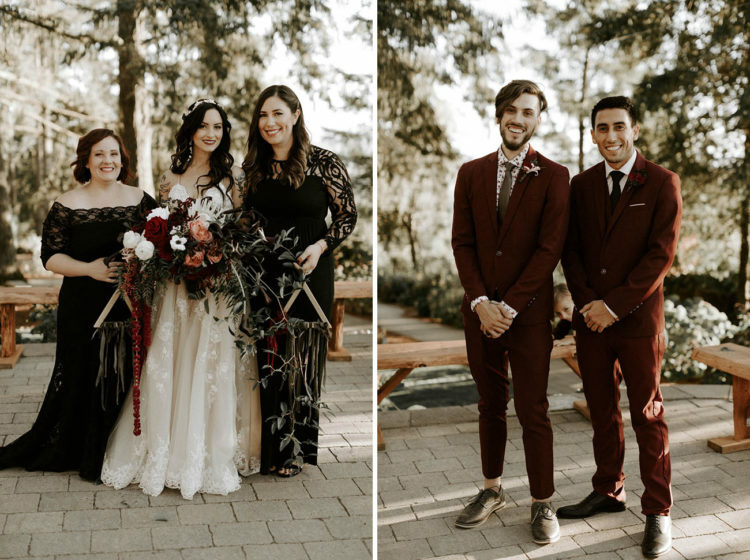 The bridesmaids were rocking mismatching black lace dresses, and the groomsman repeated the groom’s look rocking a white shirt. 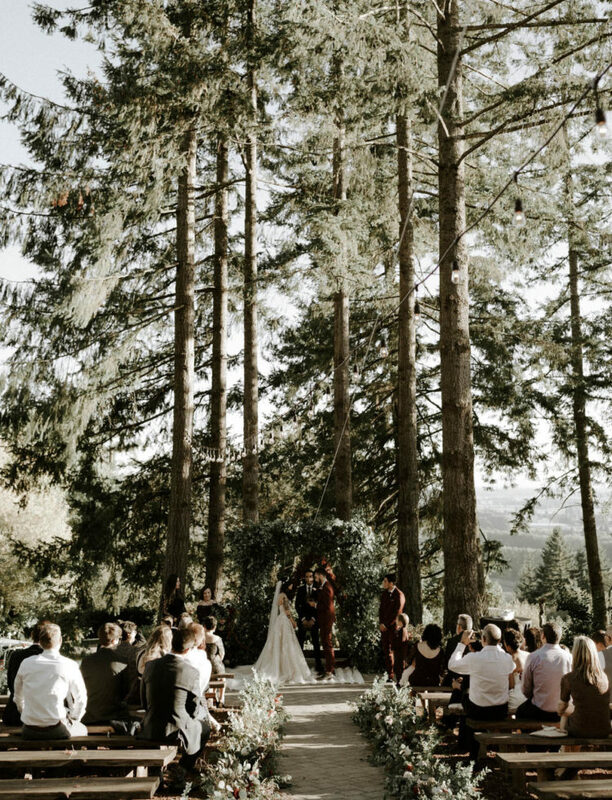 The wedding was kept classy and elegant, but with a very moody spin. 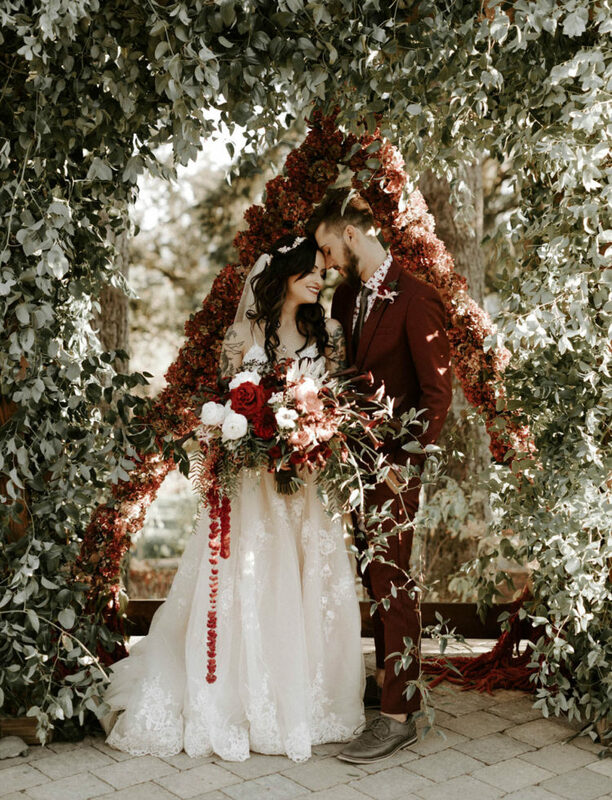 The wedding arch was a burgundy hydrangea one, shaped as a triangle for an edgy look, and there was much greenery and blooms around, some blooms were blush ones to contrast the dark hues. 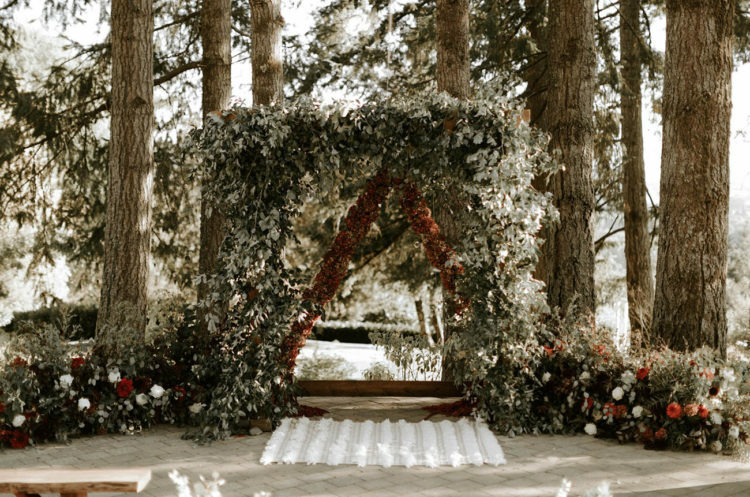 The wedding aisle was also lined up with greenery and the same blooms to give a cohesive look to the space. The lush wedding bouquet was matching – it was done with white and burgundy flowers. 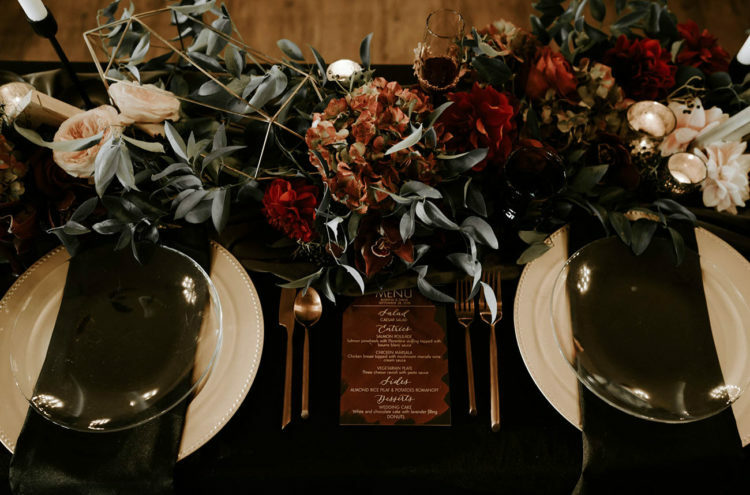 The wedding reception tables were done in blush, burgundy, black and gold, and everything tied in the burgundy hues looks so elegant. Don’t you think?